Miley is a beautiful female who is much loved by everyone here at Castlewood. She has beautiful brindle markings and produces beautiful, strong, healthy bulldog puppies. Those in the United States that are fortunate enough to own one of Miley’s gorgeous puppies are very proud owners. Here on Miley’s page, we have detailed her impressive pedigree (or family tree) which shows her Champion lineage. Being descended from such fine dogs, her puppies are very much in demand. We are very passionate about our Bulldogs, and dedicated to maintaining the integrity of the breed. For this reason we take great care with all our breeding selections. We want to make sure we give you as much information as possible about Miley, and all of our English Bulldogs. Please feel free to take a look at our gallery. It is full of images of our entire Castlewood Bulldog family, we are sure you will enjoy them. If you and your family are considering owning a Bulldog puppy, then we advise you to take some time to find out as much about this wonderful breed as possible. We will do our best to answer any questions you have about the breed, and about Miley. 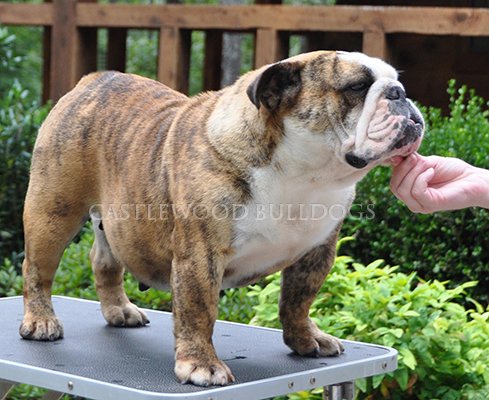 Over the years Castlewood has developed a reputation as being respectable and ethical breeders of English Bulldogs. Our dogs are descended from English and American champions and have won many awards themselves. Miley is a super mother, always caring and attentive to her puppies. If you are fortunate enough to own one of Miley’s puppies in the future, you will have a charming and loyal companion with you for many happy years. All Castlewood’s puppies go to loving, caring homes where they will be nurtured and cared for, and where they will enjoy long and happy lives. For more information about our breeding services, or to find out when Miley’s puppies will be available, please contact us.